How Can Disturbances in the Vacuum Supply be Avoided? Disturbances in a conveying system can lead to expensive production downtimes. Regular maintenance of the system can help prevent disturbances. But how can production downtimes be prevented when main components, such as the vacuum generator, are being serviced or are malfunctioning? A back-up solution is necessary. Installing an additional vacuum pump, which can be used as a standby pump in case of disturbances or during servicing of the main pump. 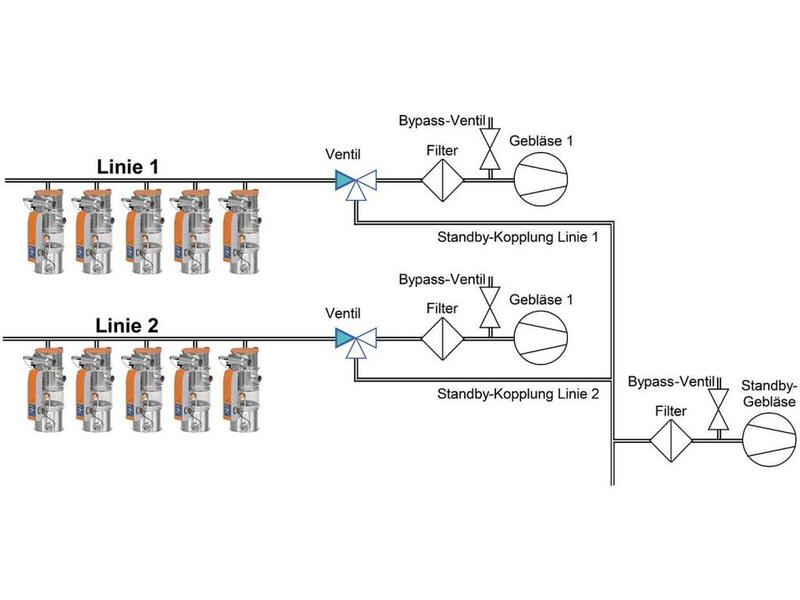 Setting up a line emergency connection in order to connect the material loaders of one vacuum line with the help of valves to the vacuum of another line. Both concepts can be summarised under the term “pump switchover“. Regarding the controls, a pump switchover can be achieved automatically or manually. A disturbance usually has the highest priority. This means that a previously manually entered assignment in the event of a disturbance is reversed by the controller, if the corresponding automatic request is activated. A line emergency connection is a temporary solution only, because a vacuum pump cannot sufficiently supply two lines. A solution using standby pumps, on the other hand, ensures unrestricted operation. In combination with a standby pump, a special mode of operation, called “rotation” or “rolling”, may be of interest. If this function is activated, the standby pump will automatically take over the work of a line pump after a predefined interval. Rotational operation ensures that all available vacuum pumps are used equally. As a result, servicing and maintenance work is consistent and predictable. Motan Colortronic is the world’s leading supplier of ancillary equipment to the plastic manufacturing sector.